The winter season is coming over to New York, it is one of the most cold and windy seasons, but also one of the most magical one. The whole city is changing its appearance and lots of Holiday lights are coming in. This is a perfect season to plan an engagement as you would want to celebrate the Holidays with your second part as an engaged couple. 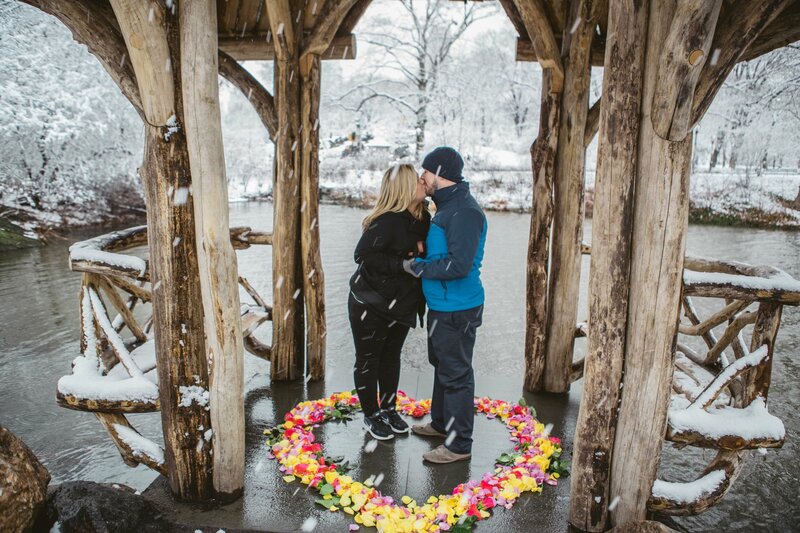 So, here are some tips from our planning team on how to plan a perfect winter proposal in New York. Ice Skating is the most popular winter attraction in New York. It is also one of the most shocking marriage proposal ideas for the winter. After the package purchasing, we sending you the VIP tickets to the skating session. You don’t need to stay in line as your VIP tickets gives you the priority entrance, also your tickets looks different then the rest of the group, so the staff knows that you are the couple for the marriage proposal.First you skate with the rest of the people and then, when the staff announced that the session is over and they ask all the people to leave you stay in. The song of your choice is playing and its only you two on the rink. Keep in mind, there is only 4 spots available during the weekend days and 5 during the week days, so its sold out fast. 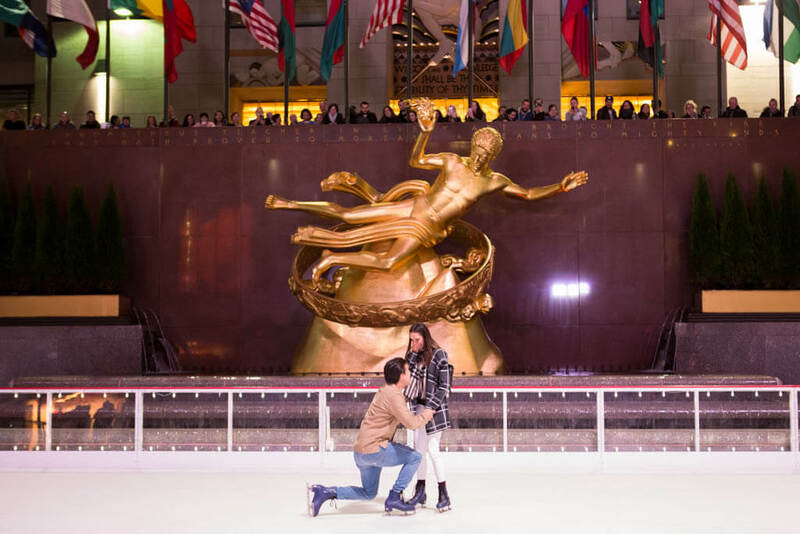 If you know you want to propose on the rink, think of it in advance and book it as soon as possible. Central Park is absolutely beautiful during the winter, but also very cold. First thing you need to keep in mind is transportation. Will you walk to the proposal spot? Use the horse and carriage ride ( great option, but limited ) or use the pedicap? ALso, by law, carriage horses are not allowed to work when temperatures are above 90 degrees or below 18 degrees. 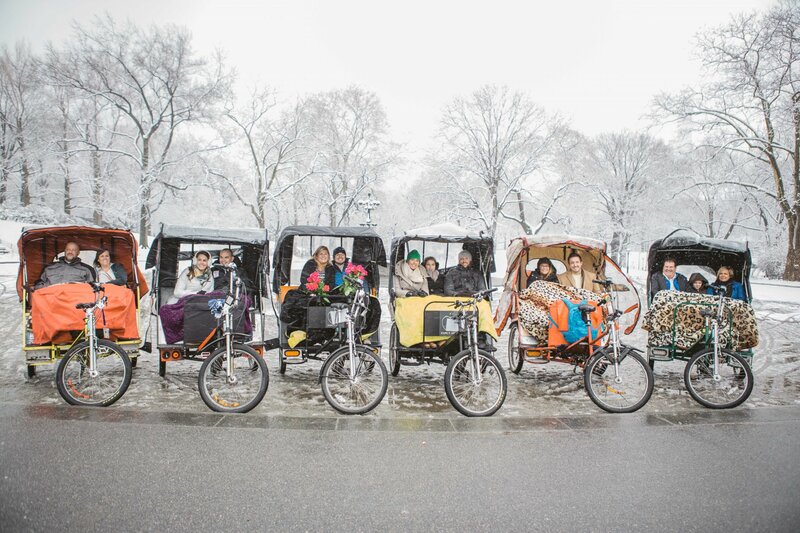 So if its cold outside and your proposal was based on the carriage ride you will need to have a plan B. We love doing the “light the night” packages at the park during the winter as it looks absolutely magical, but the later in the afternoon the colder it is. In December its getting dark around 4.30pm so you can easily arrange your proposal at 5 – 5.30 and it will be great. Dont wait till 9 pm as you will be freezing walking in a dark park and most likely will have red noses for the pictures. Rooftops are still a bog deal for the winter. With the Holiday decorations, the city skyline looks even better. Here, keep in mind the time as the later you do the proposal the colder it is. Its getting dark very early during the winter months, so you can have a nice candlelight proposal at 5pm and have a dinner after. Another thing, look for the places that has an inside room as well. This will give you freedom and you don’t need to worry of snow, wind or rain. 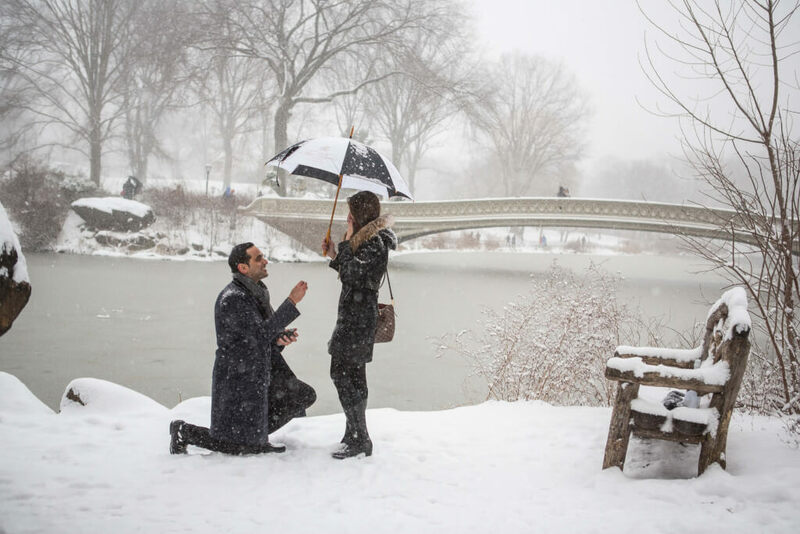 Winter might not be the best season to propose outside. A lot will depends on the weather and sometimes the New York City wind is very brutal. So places like the Top of the Rock, or Brooklyn Bridge Park might be very freezing. As an option look for the venues that has the similar view, but covered and private. A lot of summer restaurants making winter covers, so that you still have a great view, but you covered from the wind. 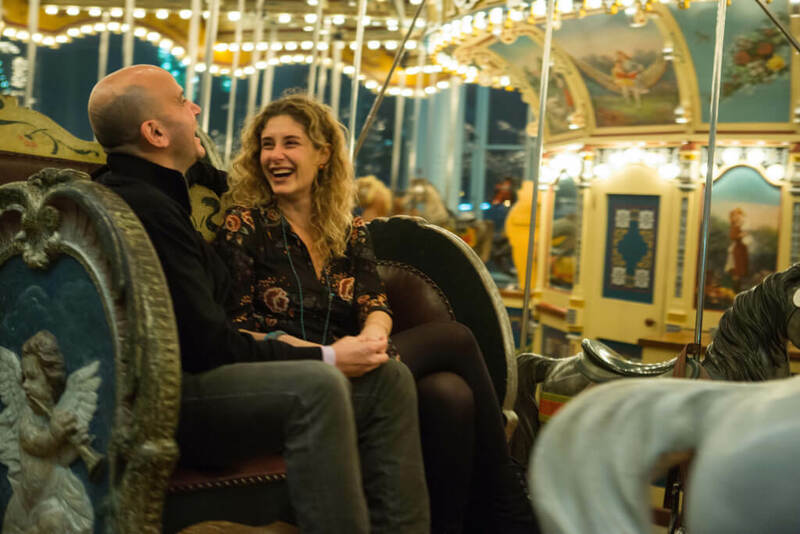 Our most favorite winter space in Brooklyn Bridge PArk is the carousel, that is private and has a fantastic view to the bridge. Dont leave it to be just a dinner proposal. 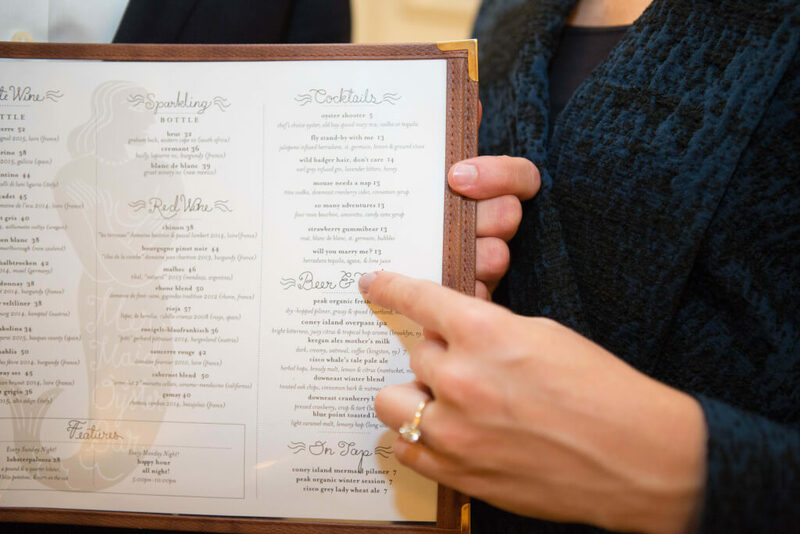 Yes, the place might be amazing and have delicious food, but add something more personal there. Like this special ” Will you marry me?” cocktail. Or hire a musician, who will do her favorite song. Ask a waiter to bring her flowers with the note ” Say YES”. Also, keep in mind a private dining room. You can decorate the place with flowers and pictures and keep her wonder, how did you plan all that. Surprise appearance of friends and family, will be a great addition to the proposal as well. Winter proposals are one of the most romantic and special, it’s the time when couples from all over the world are coming to New York to celebrate the Holidays and the city is full of magic and love. 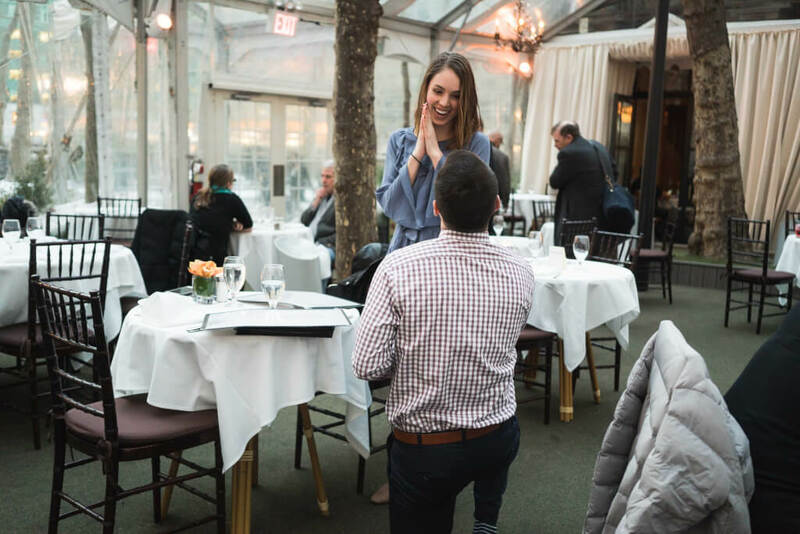 If you planning to propose in New York this Holiday season, contact us now and we will create unique and one of a kind marriage proposal for you.